Severe storm warnings have been issued for a stretch of Florida to North Carolina as Hermine intensified to a hurricane on its path toward the East Coast Thursday, and the tri-state area remains within the cone of uncertainty. With maximum sustained winds near 75 mph, Hermine was moving northeast at a speed of 14 mph Thursday afternoon and was expected to continue along that track, possibly with a slight increase in forward speed, as the center of the storm nears the Florida coast, meteorologists said. 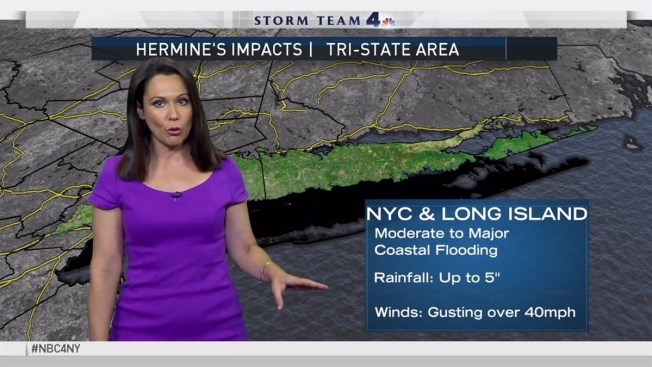 Initial forecasts projected parts of the tri-state area could fall in the path of the powerful storm as it barrels up the coast over the next few days, subjecting the region to potential driving rain, intense winds and flooding. But the latest projections from the National Hurricane Center show the tri-state falling outside the primary danger zone, though still within the cone of uncertainty. Right now, the latest models show some differences in the storm’s path, but most seem to agree that the tri-state will see rain, wind, and potentially some coastal flooding from this system, especially for areas along the coast, according to Storm Team 4. Rough surf is expected along the Jersey Shore. The National Hurricane Center said Hermine was expected to make landfall on Florida's coast Thursday night or early Friday, creating a storm surge of as much as 5 to 8 feet from Ochlockonee River to Keaton Beach. The system is expected to dump 5 to 10 inches of rain over parts of northwest Florida and southern Georgia through Friday, causing potential life-threatening flash flooding, experts say. Gov. Cuomo said Thursday that New York is not taking the storm lightly, and that several state agencies are on alert for the possibility that the system impacts the state. "I urge all New Yorkers, especially those in the downstate region, to be prepared, check local weather reports, and use NY Alert‎ to stay updated on the storm's progress throughout the weekend," he said. The system is expected to weaken after making landfall, transitioning into a post-tropical cyclone with much lower sustain winds as it moves over inland Florida. A major storm off the tri-state's coasts would likely exacerbate strong rip currents that have been observed at beaches across the region in recent days. Meanwhile, as heavy rains moved into the region Thursday afternoon roads in Babylon were already under water.